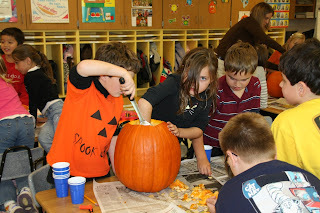 On Wednesday I went into Ryan's class to help with pumpkin math. It was really neat and the kids loved it. 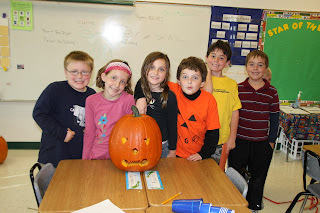 Here are pics of my group and our pumpkin. We had to weigh it, measure it, count the seeds and carve it. Then we weighed it after everything was out of it. The kids loved the gross stuff! It was a great way for them to learn while having fun! That is a very creative way of learning and fun too!